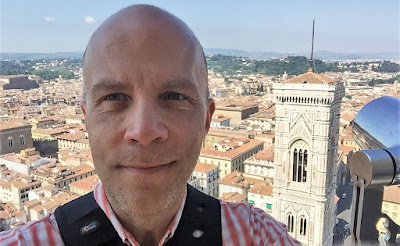 My wife and I were recently in Italy for vacation and we took a lot of photos. I took well over 3,000 photos with my Canon DSLR (and a few with my iPhone) and my wife took about 1,500 photos with her iPhone. 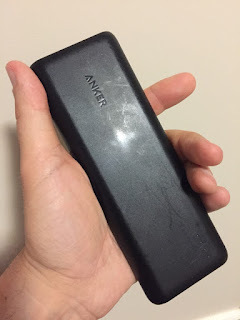 One thing that really helped her (and I) was a portable battery to keep her phone charged, and we used the Anker PowerCore 20,000 mAh portable charger for that. The need for this really came to light a few years ago when we were in London. We had just walked across the Tower Bridge in the rain, and were walking along the Thames River. We looked back and saw a double rainbow over the Tower Bridge. I hauled out my SLR and started taking photos, and my wife took maybe two photos and then her phone's battery died. No more! When we returned to Canada, we bought a cigarette-pack sized battery which did a decent job but didn't really hold enough of a charge for vacationing. 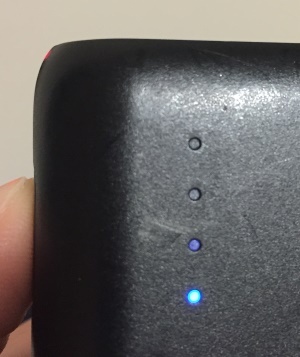 Enter the Anker PowerCore 20,000 mAh charger. This beefy portable battery can charge an iPhone numerous times, and even completely recharge a dead iPad 2. It has a lot of juice. 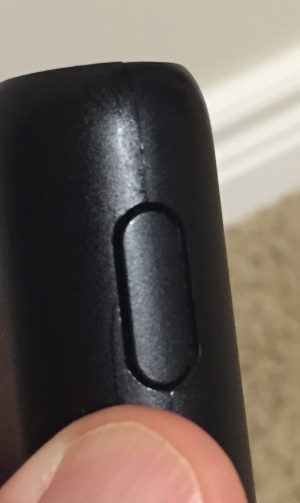 The PowerCore has two USB ports on it so it can simultaneously charge two devices. We haven't really used this feature but it is there. You plug your device's USB cable into it and plug the other end into your phone or tablet, and off it goes. Note: you do have to press a button on the Anker to turn it on. If you don't do this, it won't charge your device. Once you do this, the Anker will stay on until the device is fully charged. The PowerCore is pretty plain to look at - a heavy black pack with three ports on one end (two USB and a micro USB for charging the Anker), a single button on the side, and LED indicator lights to show how much charge the Anker has in it. Pressing the button lights the LED, with 1-4 lights indicating the relative charge in the Anker. The LEDs also stay on while charging. The PowerCore comes in a classy box with a travel bag, a micro USB cable, and a manual. You have to supply the appropriate USB cables to connect your devices, and your own USB wall charger to charge the PowerCore. Note that it takes a long time to recharge the PowerCore. Overnight might be enough to top it up but it might take 24 hours to fully recharge an empty PowerCore. It takes a long time to run one of these down but it takes a long time to fill them back up! Use a good USB wall charger that puts out at least 2A; the cheap 0.5A USB devices will take forever to charge this battery. You could use an Anker PowerPort 4 (40W) to charge it. The 20,000 mAh version is heavy - 354g or almost 0.8 pounds - and long. It's a little big to fit in a pocket of your pants without getting in the way. I keep it in a pocket of my camera bag and it's fine there. If that's too big for you, get the 10,000 mAh version at half the weight and smaller than a deck of cards. It only has one USB port but otherwise it's the same... just with half the capacity. I highly recommend this portable battery. You need to keep your devices charged and Anker is a premiere brand in the portable charger space. We used this extensively on our recent trip to Italy. My wife often had it in her pocket, keeping her iPhone at 100% charge. If she didn't have pockets, I put it in a pouch in my camera bag and we brought it out at meals to give our devices a boost. We never ran out of power. In Canada this usually lives in our van where it can charge one of our phones while the others' phone is plugged into the van's power outlet. It gets a lot of use. PS - Italy was awesome. I promise, photos are coming. This post contains affiliate links that earn me a commission when you purchase something after clicking the link, at no additional cost to you.